She was not remotely bothered by me (as you can see in the clip above), but kept stopping and locating sounds around her where threats might be: dogs, humans (possibly because some humans mistake water voles for rats due to being unaware that they exist), but also because humans tend to be noisy as they pass by and water voles do not like loud noises which may mask the sound of an approaching predator such as cats or stoats. Eventually, she swam swiftly to her small island sanctuary in the centre of the pond for a nap. Water voles have a four hourly cycle of feeding for an hour and then sleeping for the other three in one of their extensive network of burrows. But, her reason for being so shy suddenly became apparent, as a cat leapt over the wall in front of me from the pond with the juvenile water vole in its mouth. I gave chase, but it was far too quick for me and leapt over a garden wall with the hapless vole in its jaws. The cat had used a ledge on the pond side of the wall to prey upon the voles. This gorgeous young vole’s life was avoidably short-lived. It was a heart-breaking, gut wrenching experience for me. Cat predation can reduce a water vole colony. Cats that have a cheap ‘blinking’ light on their collar cut down wildlife kills and as a bonus it is much safer for the cat too. The last word in ignorance is the man who says of an animal or a plant: What good is it? What good is a water vole and why do they matter? Water voles are ecosystem engineers. These mini beavers constantly micro engineer waterways for the benefit of wildlife and us: beauty creating beauty. These constant gardeners increase biodiversity for the benefit of many species, including bumblebees, solitary bees, honey bees, butterflies, insects, insect-eating birds and bats. Their contribution to biodiversity is highly significant. Research shows that waterways with increased species rich plant communities have higher numbers of water voles. A larger number of water voles means extensive burrowing systems which have a drying effect on the surrounding soil below ground. This has the beneficial effect of altering biological properties in the soil. The longer a water vole colony occupies a waterway, the greater the burrowing disturbance which results in an even higher number of plant communities. A waterway without water voles is usually a dull monoculture with greatly reduced biodiversity. 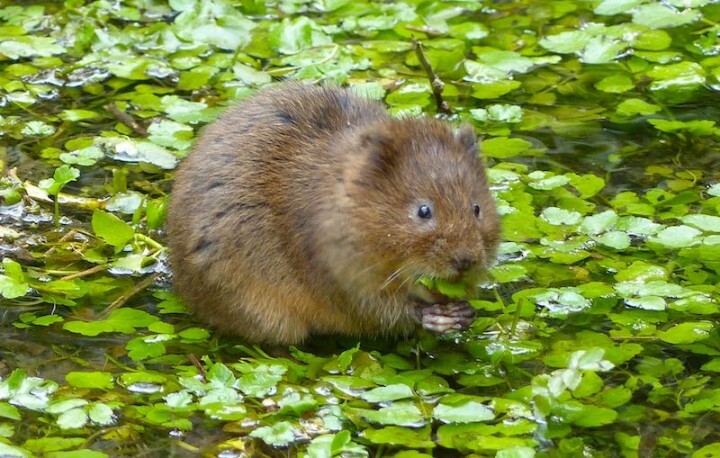 It was discovered during a national survey in 1993 by researchers Strachan and Jefferies that water voles will eat 32 species of grasses, 7 rushes, 23 sedges, 23 aquatic plants, 104 herbaceous plants and 38 species of tree. It is this diversity of food intake that could help them to survive if given some neighbourly help. So, let not our beloved water voles become a ghostly echo. How can we help water voles to thrive? As water voles have declined by 94% in the UK and need to eat about 80% equivalent of their body weight in vegetation each day, we need to make sure that they can feed, so that they can maintain a healthy breeding weight. The best way to do this is by making sure that they have at least a minimum of 5 metres of uncut bank-side vegetation to protect them from disturbance on each side of a waterway. If human disturbance is high and the path is less that 5 metres from the edge of a stream, the best prevention is to install a fence which means that water voles can happily feed without constantly being disturbed and dog walkers can happily walk on the other side. It also prevents trampling of their burrows which causes them to collapse. Such a scheme is in place along some of the UK’s canals, such as the Sharpness Canal’s edge to protect water vole habitat. Here, the grass cutting regime was altered to prevent disturbance and provide more shelter and food. The project has been a great success. Please consider undertaking one of these wonderful schemes, which will not only provide your local water voles with ideal habitat, but enable water voles to move into your area if they are absent. A sighting will fill you with delight, as you watch their characterful, charismatic antics, often marked by a familiar ‘plop’ as they disappear from view when they realise they have been spotted. Most water voles are very much like Shy Vi in my experience! How can dogs help water voles to thrive? If our much loved pets needed to be able to intake the equivalent of 80% of their body weight in food on a daily basis and remain undisturbed whilst they were eating, we would certainly make sure that they could do so. Wouldn’t we? According to the Pet Food Manufacturing Association there were 9 million dogs in the UK in 2014, which means that nearly one in four households now own a dog. As a wildlife photographer, I am very much aware of the number of dogs causing disturbance in our local environment, as I remain in one area for a considerable amount of time to film wildlife behaviour. Locally skylarks and hares are thriving best on a site where dogs are not allowed to roam freely. Research by the UK government agency English Nature into dog walking and dog behaviour has shown that around 5-7% of walkers in the uplands and 25-50% of walkers in lowland areas are accompanied by a dog; 50-90% of these dogs were off-lead. Worryingly, 14% were deemed by the researchers and observers to be running out of control. It was noted that disturbance is greater where an animal reacts in the same way to a dog as it does to a predator, such as a water vole’s flight response to dog disturbance which affects breeding success, or failure to thrive. For breeding birds there is clear evidence (both anecdotally and based on research) that disturbance exposes the eggs, or young, to a greater risk of loss caused by opportunistic predators such as corvids and gulls. On sites where visitor and dog numbers are high, the greatest risk appears to be disturbance to ground-nesting birds such as skylarks and lapwings and in a variety of habitats. Interestingly, it is thought that disturbance is caused by humans with and without dogs, but research has not been undertaken yet to prove this. It is important to note that most wildlife, such as skylarks and water voles will thrive (and even breed or nest) relatively near to busy human walking ways if a fence is installed to enable wildlife to thrive. Yet it would be wonderful if our respect for wildlife was such that a fence was totally unnecessary. Some important long-term research data on the invasive American mink, native red fox and mountain hare in Sweden has revealed that ‘When the fox is away, the mink will play’ which means that fox culls in the countryside are most likely contributing to water vole decline. A breeding female mink can cause the extinction of a colony of water voles in one breeding season, because she is small enough to enter their burrows. If we stop culling foxes in the UK it could well mean water voles will thrive, as foxes return and displace mink. Historically, fox predation of water voles has never caused severe decline because they tend to prey opportunistically, taking anything from rabbits, field voles, earthworms, to insects. They will also take fruit. Similar findings have been found since pine martens were reintroduced to Scotland. Research work, undertaken by Emma Sheehy at Aberdeen’s School of Biological Sciences (carried out in Ireland) has shown that a growing pine marten population has coincided with a decline in the population of grey squirrels and increasing numbers of red squirrels. So rather than the laborious, extensive work required by trapping and culling mink, we could let foxes help to control mink numbers and their consequential serious harm to water vole colonies, threatening their survival in the UK. Long may these water dwellers brighten our lives. Immortalised in Kenneth Grahame’s Wind in the Willows as ‘Ratty’ it would be tragic to allow their loss on our watch and deprive future generations encounters with such charismatic mammalian kin. The National Water Vole Monitoring Programme is open to anyone to take part. It’s organised by the People’s Trust for Endangered Species and their website (link above) is where you can find out all about it and get yourself registered as a surveyor. Becoming a surveyor is really easy – anyone can do it and you don’t need any previous experience or knowledge. Just check a single site near where you live once a year in May and report the result online. Projects are being led by The Wildlife Trusts from Essex to North Wales to Yorkshire, who are working hard to help the water vole thrive once again. Sustaining these initiatives and creating healthy riverside habitat for water voles and other wildlife is a high priority for them. Links to many of their schemes can be found at The Wildlife Trusts’ water vole projects page. Do send us your photos of water voles and tell us how you are helping them on NearbyWild on Twitter and on Facebook. We would love to see them and hear about your projects.